This year marks the 25th anniversary of Magic: The Gathering, which was first revealed at the 1993 Origins Game Fair, held on Independence Day weekend in Fort Worth, Texas. For an entire generation, the trading-card game has kept a huge following, and now it’s time for veteran players to relive the fond memories they’ve had surrounding Magic and for new players to join the Magic community and see what all the fuss is about. It’s been known for a while now that 2018 would be a marquee year for the game, and lately the team at Wizards of the Coast has been busy rolling out the red carpet with previews of what they have planned over the course of the year. First up is Masters 25, which releases on March 16. The Masters expansions are supplemental sets that contain reprints of popular cards, intended to help level the playing field in the game’s more powerful formats, such as Modern and Legacy. Masters 25 in particular has been designed with nostalgia in mind, as the packs are going to be filled with beloved cards from throughout the past 25 years, with at least one card representing each major set. The cards contain watermarks in their textboxes that feature the symbol of the set they were first printed in, as seen here with Nicol Bolas, Dominaria’s most ancient evil. He’s a bad guy. 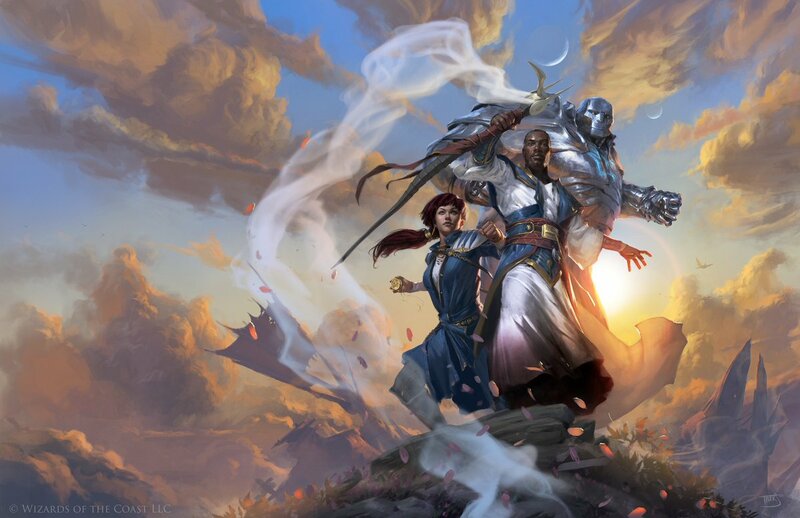 Speaking of Dominaria, April 21–22 is the Prerelease Weekend for this year’s first Standard expansion, Dominaria. In keeping with the nostalgic theme of Magic’s 25th, Dominaria takes players back to the world where it all began. For me, someone who joined the community fairly recently in the grand scope of things (mid-2012), it seems rather strange that in a setting whose main premise is that rare individuals can travel between the planes of the Multiverse, much of the game’s early life took place on this single plane. Familiar faces from Magic‘s past shall be reintroduced in Dominaria. As such, Dominaria holds a special place in the hearts of longtime Magic players. Story-wise, the plane has been rent and scarred by temporal havoc that occurred in the Time Spiral block (trilogy of sets), and while little else is known about the set yet, I speculate that this timey-wimeyness will be represented by the mechanics of the set in some way, as well as offering another opportunity to showcase the game’s rich history. Dominaria (the set) is also special in that it represents the end of blocks, and from now on each Standard set will be independent but will still be designed to play well with the sets that preceded and will follow it. This means that the game can shift between planes or remain where it is for as long as suits the story and vision for the setting, which thrills me as a story-focused fan. Finally, June 8 is Magic’s summer release, dubbed Battlebond, which is a set suited for two-on-two out-of-box play using Magic’s popular Two-Headed Giant format. Never before has a set been specifically made for Two-Headed Giant, and as the set name suggests, it will be a fine time to “bond” by teaming up with a fellow player or introducing someone new to the world of Magic. I’m sure there is more to come that has yet to be announced, and I look forward to discovering what the rest of 2018 holds for Magic: The Gathering. I just hope all the excitement doesn’t leave me broke. It’s a New Year. So Let’s Talk About Video Game Criticism!